Raymond Parks, one of the founding members of NASCAR and the owner of its first championship team, died Sunday. He was the last surviving NASCAR founder, and he was once jailed for illegally transporting liquor. Say it with us: Sigh. 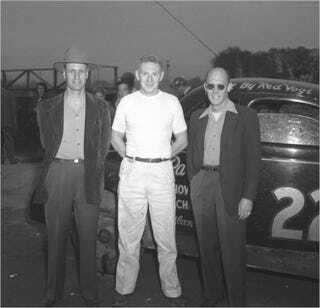 Parks — he can be seen at left in the picture above, along with crew chief Red Vogt and driver Red Byron* — was a team owner who never drove, but he played a vital role in the evolution of stock-car racing and was present at the December 1947 hotel meeting that marked the sport's official founding. He was also once jailed for operating a fleet of cars that illegally moved booze into dry southern states. Which is cool as hell. If you have a minute or two, read Parks's New York Times obituary, a short, informative reminder that once, racing personalities were real people, not sanitized caricatures. When you're done, sit back, look out the window, and google the phrase "dirt oval." (There's one near you. I promise.) Seek one out, take a kid with you, and pick the dried mud out of your hair later. NASCAR's golden era may be gone forever, but the building blocks are still there. Enjoy them while you can. *In other news, we really, really wish we lived in an era where people were given legal names based on their hair color and/or temper. Sigh again.